Jack Ryan’s provides a beautiful setting for your wedding, with many options for ceremony setup and décor. And once the vows have been exchanged, our staff will make a seamless transition for your reception while you and your guests enjoy a cocktail hour. With a Jack Ryan’s event, you will never have to worry about inclement weather and because we offer turnkey service, there are no concerns about coordinating with multiple vendors. Jack Ryan’s, in the heart of downtown Tyler, offers an ideal solution for your wedding with space for up to 200 guests. You’re not required to select from a predetermined menu. Instead, our chef and bartender will work with you to develop a spectacular food and beverage menu, guaranteed to exceed your expectations. For the bride who wants to streamline the planning process, we offer packages with a group of preferred vendors whose quality of work matches the rigorous standards employed by Jack Ryan’s. In addition to our catering and bar service, these packages include planning and coordination by Event & Company. Unique floral design and décor will be provided by Moss – Where Flowers are Fair. Customized bride’s and groom’s cakes will be tailored for you by Kemp’s Cakes, your professional sound equipment and emcee come from CMB Music Productions. Our packages allow you to completely personalize your wedding; we’ve simply assembled a team of outstanding vendors to turn your dreams into reality. All chairs, linens, dishes, and stemware are included, eliminating the need for additional rentals. Our valet service will take care of parking for all of your guests, and our exceptional serving and bartending staff will see to their every need. The bride and her attendants have the option to dress at the downtown studio of Callynth Photography, using the professional hair and makeup dressing area. Callynth will document the day from preparations through the wedding and reception, as well as providing both engagement and bridal photography sessions. 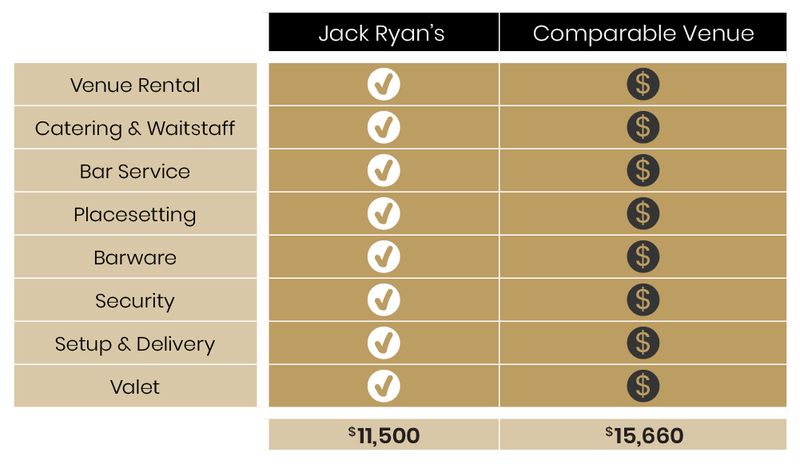 Jack Ryan’s will help you create a custom event. From the arrival of your first guest through the last dance of the evening, your vision of the perfect wedding will come to life as Jack Ryan’s makes your special event shine! Don’t want to spend your time finding vendors? Let our team handle the details with our comprehensive package. Fully customizable 3-course gourmet, chef-created meal plated & served by highly trained & uniformed staff. Fully stocked well to top-shelf options served in all glassware by our excellent staff. Bride’s & Groom’s Cakes tailored for your theme. Two Experienced Wedding Coordinators to assist in the planning process and ensure your Wedding Day runs smoothly.